The Pig is a symbol of good luck, abundance, determination, agriculture, greed, materialism, fertility, forward-thinking or -moving , and sincerity. The pig is connected to the spirit of mother earth. This means you always stay in touch with nature, and greens, being present in places where there is abundance in all senses. You have the power of self-awareness that helps you stand on your own feet. You will always be in a position to withstand the storms and vicissitudes of life, and eventually, emerge as the winner. With this power of staying strong, you resultantly have the ability to move forward. You understand the value of time and know that only the present moment is in your hand. So you believe in doing things now (or never). Like the pig, however, you tend to be lazy at times, trying to ‘smell’ everything by your sensitive ‘nose’, and explore as to what is going on around you. You make your move only when you think the time is right. If you see a black or a muddy wild pig, it means, you are in a clumsy (bad/vicious) situation in life from which you want to come out. If you see a clean, white/pink pig on a pet animal farm, it signifies abundance, growth, and prosperity. Seeing a pig’s head, or a dead pig represents the evil within us. A vision of a pigtail in your dream means you are particularly a gifted individual who is in touch with the spiritual world. The dream of a pig attacking you wants to give you the message that you are being greedy and materialistic about certain things in life. A flying pig with wings symbolizes that something you are earnestly praying for will never come to you, and is practically impossible. Feeding a pig in your dream brings in good luck. Dreaming of a wild pig is the symbol of your inner lust and overindulgence about someone or something. A piglet (female or male baby pig) prognosticates that you are handling certain situations or projects in your life with a lot of care, as if like your baby. A pig or a wild boar, Yagna-Varaha, is the third incarnation of Lord Vishnu that saved Mother Earth from the evil forces. Alternately, in Shaktism, His female energy is represented by Varahi that appeared while demolishing demons. The Buddhist philosophy holds the pig as a symbolism of the ignorant dark. A black pig is depicted on the ‘wheel of existence’, signifying one of the three illusions in the human mind. According to the Bible, the pig is a symbol of greed, laziness, inactivity, and sloth. The Muslims, like the Jews, consider the pig (or swine/hog/boar) as unclean, and hence it is forbidden to consume pork in Islam. The Native Americans linked the pig to agriculture, production, fertility, and abundance. They would thus view the pig as the harbinger of rains. The ancient Japanese people would view pig as a frightening and reckless creature. Several Japanese words and phrases refer to their reckless nature. Even the Japanese hunters would admire the animal for its bravery and courage, and it was not uncommon for them to name their male children after the creature. Among the 12 animals of the Chinese zodiac system, the pig (boar) is the last. Individuals born in this year are said to hold pig-like traits, characterized by impetuousness and determination. 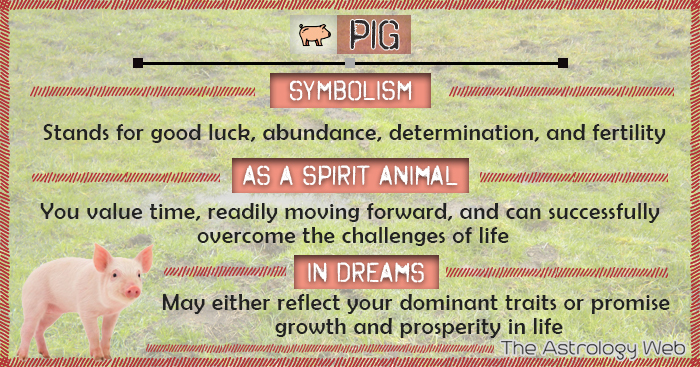 The scriptures of Feng Shui hold the pig as a lucky trait. It recommends that keeping a golden pig in one’s house would bring in good fortune and prosperity. There are many references to pigs in literature, among which, ‘The Three Little Pigs’ is a world-famous English nursery rhyme. There are also interesting idioms in different major languages that are frequently used. In English, ‘a pig in a poke’, ‘to grab the nearest pig’, in German, ‘still not kept the pigs together’, in Spanish, ‘each pig gets its St. Martin’, in French, ‘if the pig is little, don’t eat him’, or in Afrikaans, ‘to be the pig in the tale’ are only to name a few. It is a common belief that saving a currency coin/note every day in one’s ‘piggy bank’ initiates wealth, abundance and strength, and by doing so, one never needs to face the mundane needs or poverty.